Peggy Watkins always starts with the eye of the hunting dog. Or elephant. Or lion. 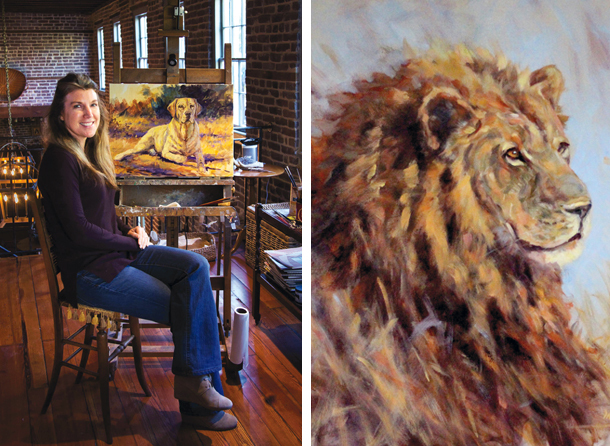 An avid traveler and wingshooter with a “bush home” in Zambia, Watkins is not your typical coastal-city painter. The former CPA, whose girlhood love of art took a back seat to a practical accounting job, didn’t start her painting career until age 38. It began serendipitously: in 2003, she and her husband, Todd, happened to move into a home across the street from the Atlanta College of Art. Night classes there led to private training, and in 2008, the Southeastern Wildlife Exposition (SEWE) selected her as its featured artist. Charmed by Charleston, she relocated here in 2013 and this year can be found exhibiting in SEWE’s Fine Art Gallery, this Friday through Sunday in Belmond Charleston Place. Charleston magazine will be at Brittlebank Park during SEWE, February 16-18. For the scoop on all the happenings there—and throughout the expo—click here.